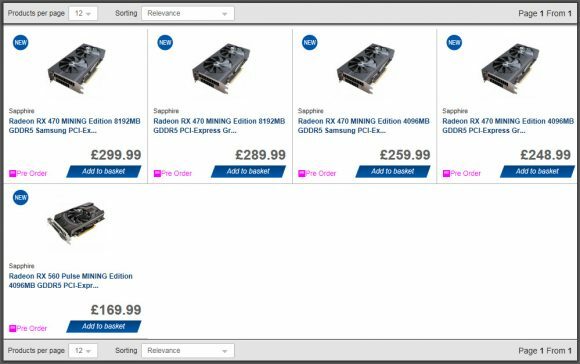 Not a lot of details about the upcoming AMD-based Crypto Mining GPUs from Sapphire Yet, though they have been already listed for pre-order over at Overclockers UK. There are four Sapphire Mining Edition video cards listed that are based on AMD’s Radeon RX 470 GPU with different video memory configurations, all of which are without external video connectors. There is also a single AMD Radeon RX 560 GPU also labeled as Mining Edition, though it is a bit different with a single DVI connector on the back, so it can be used for other things than just crypto mining. It is interesting to note that the Sapphire Mining Edition cards do come with 1 year warranty instead of the regular two or even 3 years warranty that Sapphire cards targeted at gamers usually have (depending on the market). It is interesting to note that the store lists the type of memory on different models and what mining performance they will be able to offer for mining Ethereum (ETH). There are two values that apparently represent the stock and the modified BIOS result, though it is not yet clear if the dual BIOS comes with modified settings, or Sapphire has just left that part to the miners. Unfortunately the prices listed for pre-order are not making these very attractive alternative compared to the regular models, though with the current shortage miners may not care that much as long as there is stock of these new Mining Edition cards from Sapphire available. Something that is important regarding the warranty of regular Sapphire GPUs that are not originally intended for mining, the website of the company has some additional terms listed about mining usage, here is a quote below. Warranty may vary from Country/Region, the customer must verify directly with the SAPPHIRE Authorized Dealer/Reseller from where the product was purchased as to the specifics of Warranty provided. So make sure you check the warranty information of the seller whether you are buying regular gaming GPUs or any of the Mining Edition cards to make sure about the warranty period you get with each. We have already received reports form users that some retailers are selling GPUs without any mention about warranty getting void on their websites if they are being used for crypto mining and you get that told to you after you purchase the cards and have them shipped to you.